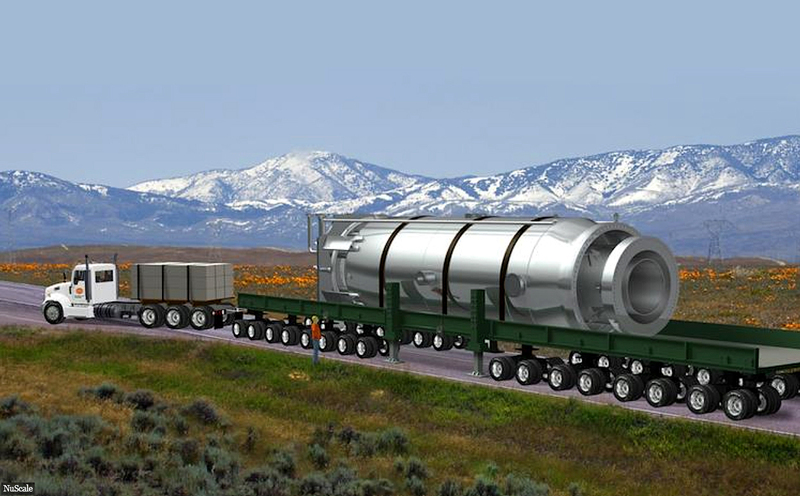 NuScale: An Advanced, Conventional 50 mW(e) Small Modular Reactor. Simplified for Safety, A "Technological Bridge" Nuclear Reactor for Power Plants. grid of the Pacific Northwest. 12 very small "walk-away safe" reactors, not one huge bundle of energy. A 50 megaWatt NuScale nuclear reactor is smaller than the 2 megaWatt diesel engine-generators often used as stand-by generators. A typical wind turbine produces 2 megaWatts at maximum output. Unfortunately, this reactor is tied to the past in somewhat the same way as the original 1712 Newcomen atmospheric pressure steam engine was tied to technologies that preceded it. A relatively low reactor operating temperature of 550°F means it has no chance of replacing the heat of fossil fuels beyond boiling water to power low-efficiency steam turbines. There are other reactor manufacturers also developing "bridge" reactors, General Electric's BWRX - 300, Holtec's 300 megaWatt(e) unit, etc. 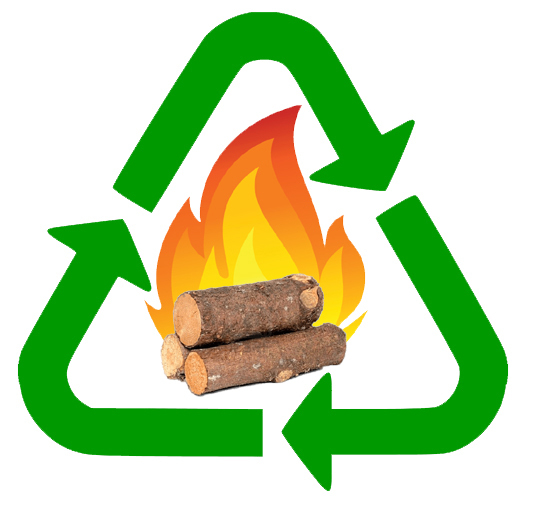 Molten salt (1,300°F salt) and pebble bed (1,800°F helium) reactors can exceed the performance of the typical coal power plant boiler (1,100°F steam), enabling man to completely replace fossil fuel fires - either directly or indirectly through the use of nuclear energy's electricity and heat to manufacture carbon-neutral biosynfuel combustion fuels. Behind today's massive world-standard water cooled solid uranium pellet fueled nuclear reactors is a story that is hauntingly similar to the story of the world's first steam engine, the 1712 Newcomen steam engine. While history doesn't repeat itself exactly, it rhymes surprisingly often. Steam engine explosions that leveled towns and killed thousands, inefficient to the point that only coal mine operators could afford the massive amounts of coal it consumed, very limited in the kinds of applications it could power, the first steam engine was replaced less than seventy years later - in 1780 - by the same reciprocating steam engine we are still building today - the Watt steam engine. Newcomen's steam engine was a vacuum engine - notice the quick spurt of cooling water into the boiler. To be clear, England's 1712 Newcomen vacuum steam engine was a big step forward, it replaced horses that were being quickly worked to death lifting large amounts of water from deep coal mines. But, as you can see, it couldn't make shafts turn like the waterwheels and windmills that were being used to power England's spinning mills at the time. The more efficient 1780 Watt steam pressure engine used far less coal to make the same power and, using Leonardo da Vinci's (1452-1519) crank invention to turn back-and-forth motion into rotating motion, could replace waterwheels, windmills, and, a few years later, power railroad locomotive wheels and ship's paddle wheels. In turn, the Watt steam engine eventually became a technological bridge for the development of much more powerful steam turbines in 1884, (oil powered ships), and then later, gas turbines about 1930, (jet engines). In your author's opinion, the NuScale nuclear reactor is a technological bridge between solid fuel, water cooled nuclear reactors and liquid fuel, molten salt cooled reactors - a safer integration of solid fuel nuclear energy and water cooling - with the 70 year time interval between the two nuclear technologies being almost the same as the time interval between the first two steam engine technologies - Newcomen and Watt. It takes time to come up with the bits and pieces necessary to build better versions of the same thing. One might make a similar time interval observation about tubes and transistors with the transistor being a bridge technology leading to today's integrated circuit microchip. 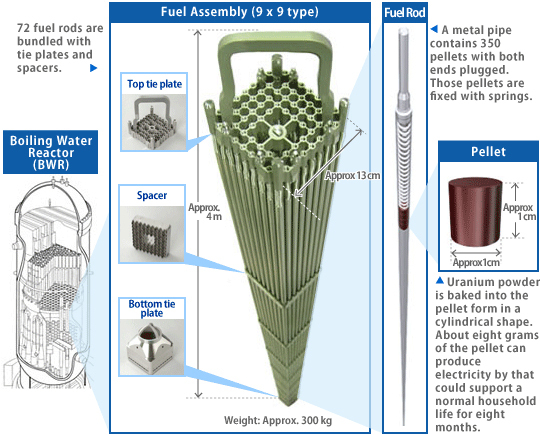 NuScale has developed the concept of a safer, simpler, more economical conventional water cooled nuclear reactor to a level not attained by any earlier conventional reactor. It's unlikely further improvement of this type of reactor will be made. Unfortunately, like all conventional uranium reactors, it's nuclear waste will contain extractable amounts of plutonium-239 that can be used to build nuclear weapons. What NuScale gave up was high energy density. A NuScale reactor produces only 50 megaWatts (mW) as compared to the 1,800 mW produced by the latest and greatest conventional reactors. So, like a large multi-engine airplane, multiple NuScale reactors at a single site are envisioned as a good way to power a large city very reliably. Unlike large reactors however, the NuScale's small size enables it to have the thermal and electrical agility necessary to fill in for the electricity lulls and surges caused by wind and solar electricity sources. This is important since our new wind farms are forcing power companies to add large numbers of quick-acting fossil fuel natural gas electricity turbines as a way to keep our electrical grids reliable. Adding more fossil fuel electricity to the grid is not a good trend with more electric cars coming down the road. The first example of a NuScale reactor power station is being constructed on Idaho National Laboratories (INL) property, where all the first nuclear reactors were developed. It will go into service testing connected to the U.S. Northwest electrical grid alongside large wind farms, small solar, several average coal electricity power plants, and the Columbia nuclear power plant. It won't take long to see if it can fill in the grid energy gaps caused renewables like wind and solar on a day-to-day basis. This will go a long way toward ending wind and solar's "battery anxiety". NuScale APPEARS to have switched to this non-zirconium clad fuel. The world continues to build modern examples of the nearly 250 year old Watt steam engine. Your author is confident descendents of the new classic NuScale SMR reactor design will continue to be built 250 years from now. And they will be even safer. For example, “Enhanced accident tolerant fuels are revolutionary concepts of the next generation to be deployed within the next decade,” said Elmar Schweitzer, AREVA’s senior expert on Materials and Thermal-Mechanics at a IEA COP23 side event in November, 2017. These advanced fuel rods have passed preliminary testing in a reactor in Norway and are beginning pre-commercial testing in the United States. or increase the power of a same size new-build plant by 30% - i.e., build 3 and get the power of 4. The first use of Advanced Nuclear Fuel Rods in the United States is anticipated to be in 2021 - 2023. The Emergency Planning Zone (EPZ) is the area surrounding the nuclear power plant within which special considerations and management practices are pre-planned and exercised in case of emergency. In practice there are two EPZs surrounding the plant site. The first, called a Plume Exposure Pathway, is traditionally at a 10 miles radius for conventional nuclear plants, and is designed to avoid or reduce the dose from potential exposure of radioactive materials from the plant. The NuScale's Plume Exposure Pathway radius has been determined to be 0.141 miles (or 744 feet) as compared to 10 miles for a conventional nuclear power plant. The second, called the Ingestion Exposure Pathway, is about 50 miles in radius for conventional nuclear plants, to avoid or reduce the dose from potential ingestion of food contaminated by radioactive materials. For both zones specific emergency procedures are in effect. As of July 3, 2018, your author has been unable to learn if an Ingestion Exposure Pathway for the NuScale has been determined.